This chicken, chickpea and sweet potato stew manages to feel both hearty and healthy, making it the perfect supper for cold weather. The mixture of coriander, cumin, turmeric and paprika adds gentle spice with just a hint of sweetness. Once made and cooled, it will keep in the fridge in a container with a lid for 2-3 days – so you can make a big batch on a Sunday and not have to cook for another couple of days. Just reheat in a saucepan until piping hot. This moussaka is a delicious way to get loads of veg into one dish. Make it that little bit heartier by swapping the cheese topping for the more traditional moussaka topping of sliced potato and white sauce. Peel 3-4 medium potatoes, boil until tender, then leave to cool. Make a basic white sauce – melt butter in a small pan, stir in an equal amount of flour until you have a smooth paste, then slowly add milk and keep stirring until the sauce thickens. Season to taste. Cut the cooked potatoes into slices and arrange on top of the lentil and aubergine mixure, then pour over the sauce. Place in the oven at 180°C for about 30 minutes. We should all be trying to eat more of what’s in season – fresh produce is often more nutritious than fruit and veg that’s had to travel a long way, and it’s more environmentally friendly. 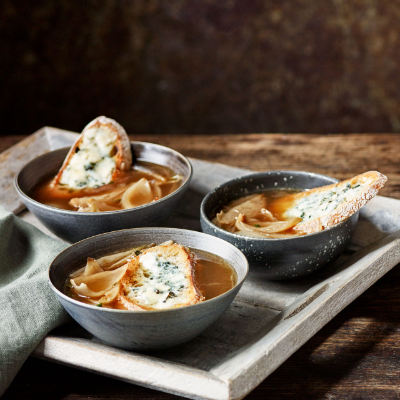 October’s the time to know your onions, and this soup is a great way to make the most of them. Roasting the onions brings out their sweetness, which makes this soup rich and tasty enough for even the chilliest autumn day. The roquefort toasts add a touch of indulgence. Doing some Halloween pumpkin-carving? These puff pastry rolls give you a tasty way to make sure the flesh doesn’t go to waste – and you can use squash if you’re not getting crafty this Halloween. They make great canapés if you’ve got friends round for drinks, and they also make a lovely work lunch that’s a bit more exciting than a cheese sandwich. It’s not autumn without a crumble, and why mess with the classic apple pudding? Adding oats to the sweet, buttery topping gives extra crunch and texture. Why not cook some extra apples and set aside to give you an apple compote to have with yogurt or porridge for breakfast? When it comes to the crumble, however, we’ll leave you to decide whether to have it with cream, ice-cream or custard. We couldn’t possibly pick a favourite. Got any favourite autumn recipes? We want to hear about them, so share them with us on Facebook or Twitter.